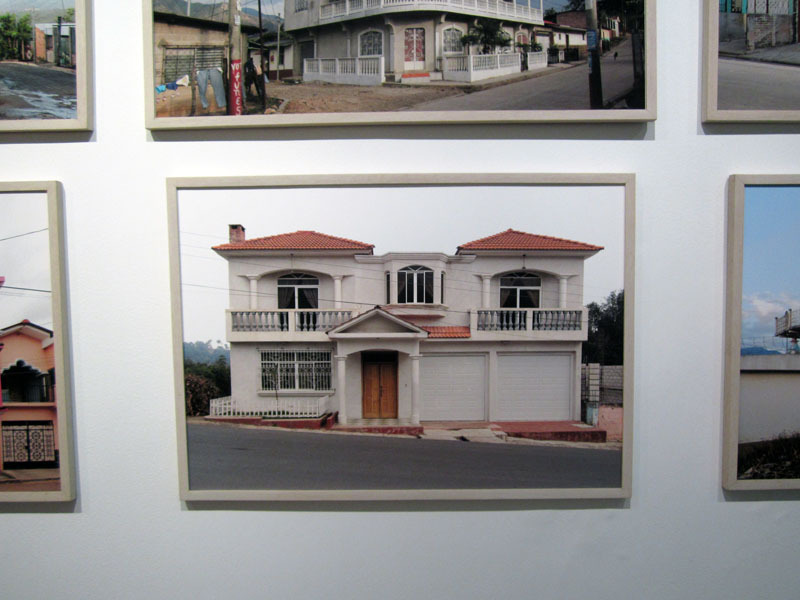 The Spanish cultural center in Lima is hosting a show about the architecture of Remittances (Arquitectura de Remesas). 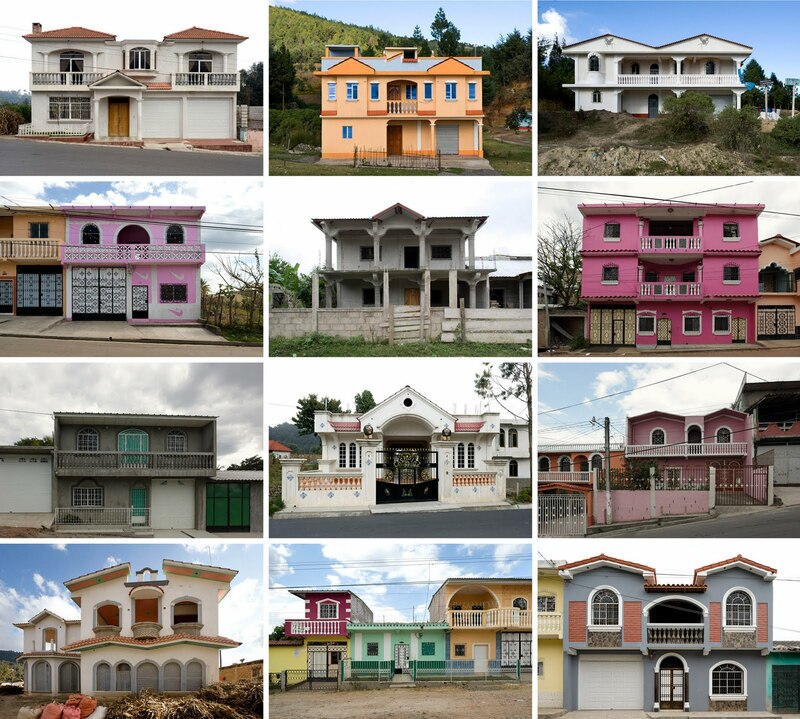 Organized by El Salvadoran artist Walterio Iraheta, the show features photographs of houses in Central America built with money sent home by relatives working in the United States. This project looks at 9 different communities, three each in Guatemala, Honduras and El Salvador, with large emmigrant populations and the houses built with money sent home. The project seems to be an outgrowth of Iraheta’s series, Farway Brother Style, with there being a lot of overlap in both. The houses mostly seem to follow local contemporary vernacular styles (with the volume turned up to 11), although there are several houses that look as if plucked out of some Southern California subdivision, suggesting a difussion of style (the pseudo-spanish inflections of California residential arquitecture is a topic that will be left for another post). There is a certain off-the-shelf quality to the photos. They are OK but clearly subservient to the broader idea of the exhibit and the social phenomena of Central American migration to the United States. They lack beauty of say, Eduardo Del Valle and Mirta Gomez’s series From the Ground Up, on houses in the Yucatan (a 20+ year project). Still, I love these sorts of projects. Most fascinating for me was this panorama of San Mateo Ixtatán in Guatemala. It, literally, moves beyond the individual houses and shows the broader context of these houses within their communities. 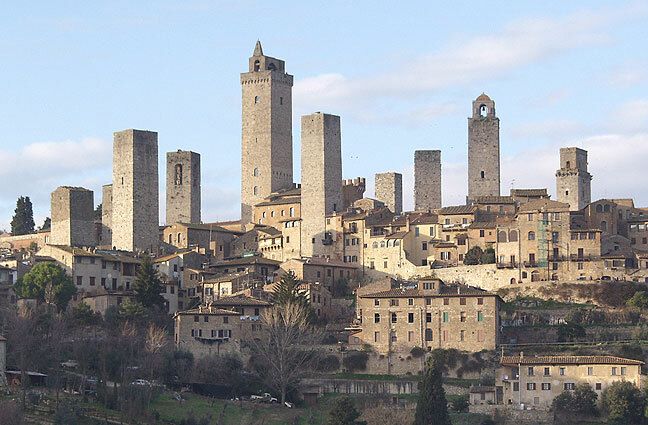 Looking at the above photo, I was reminded of San Gimignano with its medieval towers (a result of similar dynamics of new wealth and social status being reflected architecturally). This entry was posted in Contemporary Photography, Thomas Locke Hobbs Blog and tagged American Migration, Arquitecture, Contemporary Photography, Cool Image, Difussion, el salvador, Farway, Features Photographs, Guatemala, Honduras, Inflections, lima biennial, Medieval Towers, Mirta Gomez, Nbsp, New Wealth, Peru, Photographer, Photographers, Photographs, Photography., Remittances, San Gimignano, San Mateo IxtatáN, Several Houses, Social Phenomena, Southern California Style, Uncategorized, Vernacular Styles, walterio iraheta, Working In The United States, Yucatan on April 9, 2012 by thomashobbs.